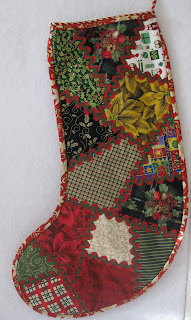 This is the first time I made Christmas stockings, so now my younger boys each have one. They love them! My mom had brought me some cool ric-racs from Brazil, and this one was red and green, perfect for this project. I selected a few different Christmas fabrics for the front, and used one of them for the back of the stocking. We decorate the house for Christmas the day after Thanksgiving, and I am looking forward to featuring the new stockings. The house is clean 'today' (it won't stay this way until then, pity! ), tomorrow I will shop for the Thanksgiving dinner, and on Friday we will get all the decorations out. I cannot believe how fast Christmas is arriving this year!!! Very nice! I'm sure the boys will be delighted when Santa leaves gifts in their stockings!